We are engaged in manufacturer of Herbal Extraction System, Our advanced technology plant mainly designed for various Herbal Extracts from parts of plant or tree such as leaves, flowers, seeds, barks, roots and shrubs. Our process line and technology designed by highly experienced technocrats focusing on the high recovery of extract at low cycle time and at low operating cost. The process and the plant design of extraction system is invariably different from product to product and component to component. Its very difficult to generalize a process to extract isolated compounds from various herbs. From raw material to isolated compound, a series of processes will be involved. 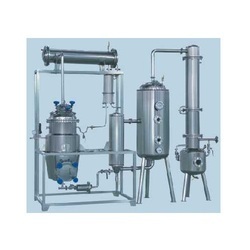 Our plant consists of Peculation extractor with counter current system to reduce the use of Alcohol and thereby reduce the distillation time for Alcohol recovery. We adopt Evaporator under vacuum or Multi Effect Distillation or Falling Film or Raising Film Evaporator as per customer requirement. Looking for Herbal Extraction System ?